The cards are all very simple, as I just wanted to see what the Art Stamp images looked like. I realised with these last three cards that my Versafine ink pad needs replacing, but I like the patchy effect. The background colour showing through the black is very effective. 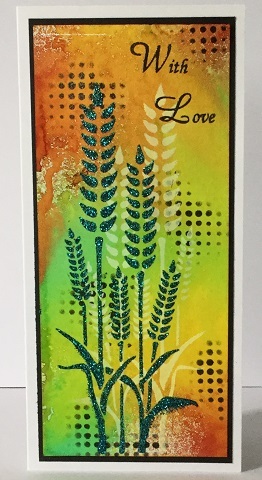 I can safely say that I'm looking forward to a lot more playing with both the Mixed Media Ink Sprays & the Art Stamps. There are so many techniques I want to try, so watch this space. I'll try to be back with more projects over the weekend. Hello everyone, hope you're well. Kirsten here with an update of what's been happening in Imagination Land recently. April 9 saw us at Alexandra Palace in London for the Crafting at Ally Pally show. Sue demoed for most of the day on the BJ Crafts stand, alongside Jean of BJ. Lisa B was there too & it was great to meet so many lovely crafters. It was a really enjoyable day. Thank you to everyone who visited the BJ Crafts stand over the weekend, we hope you enjoyed the show & found lots to inspire you. the video on our Facebook page. 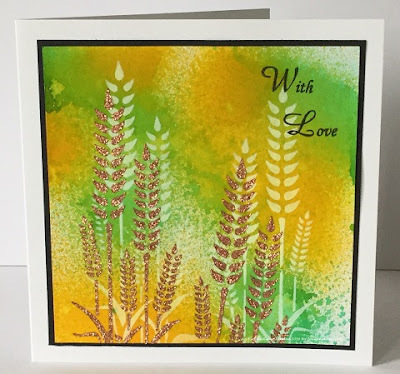 More videos can be found on Hochanda's page. One handy tip; give the bottles a good shake before you spray. There's lots of colour pigment in the bottles & if they're standing upright for a while, some of that pigment will settle at the bottom. A good shake will mix everything together again. Inks used on these backgrounds; Yellow, Orange, Light Green, Dark Orange. I used white gesso first through the Wheat Panel stencil on the ink sprayed backgrounds, then Light Copper Sparkle Medium on the card above & Blue Moonstone SM on the DL card. That's all from me for now. 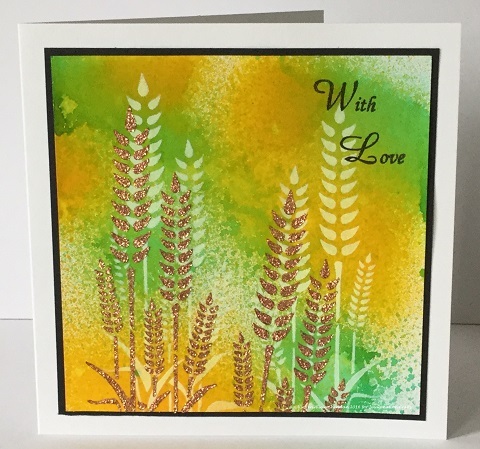 I hope to be back tomorrow with the first cards I've made with the wonderful new Art Stamps. Sue & Lisa are preparing for the next ODS on Hochanda, April 29 - 30 & we'll have more information on that in the coming week. or via our Facebook/Twitter pages. Until next time, thanks for visiting the blog & for your continued support.